One of the foremost policy organizations in the state, the client – the Public Policy Institute of California – is a think tank dedicated to impartial and non-partisan research that informs the public policy decisions of the State. 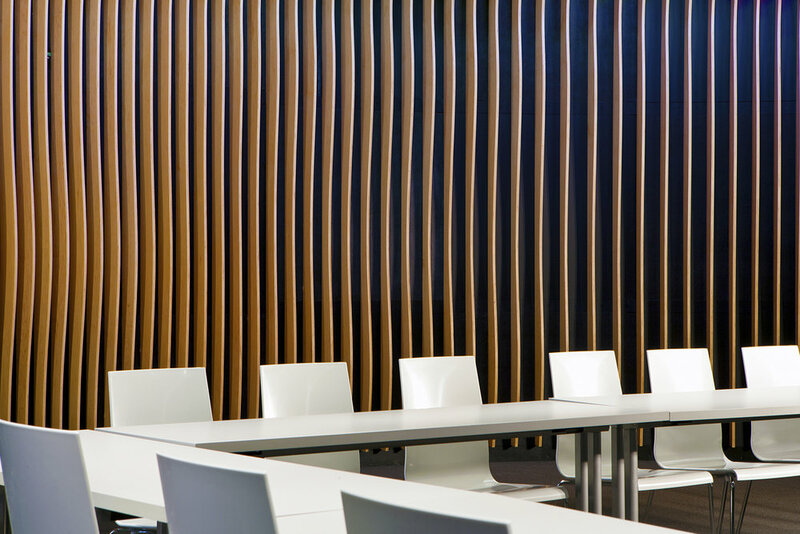 Their new conference center communicates these ideals of openness and informed discussion, and presents a forward-thinking image appropriate to the institution. The forms and materials employed reflect the inviting and open quality sought in the institution’s discourse, while the modern aesthetic fosters an environment fitting for dialogue. Inspired by King Arthur and his mythical round-table, the Forum’s circular plan makes for an apt geometric metaphor for the center’s non-partisan ethos. The main elements of the project are the “Forum” – an assembly venue and the “Salon” – a reception and a soft meeting area. The round Forum, enhanced by the riveted hot-rolled steel-clad exterior, translates into the literal embodiment of a think “tank”. Although the circle symbolically provides the perfect architectural metaphor for “no corners”, it presents the challenge of overcoming the corresponding focus of sound waves towards the center of the space – an acoustical problem. 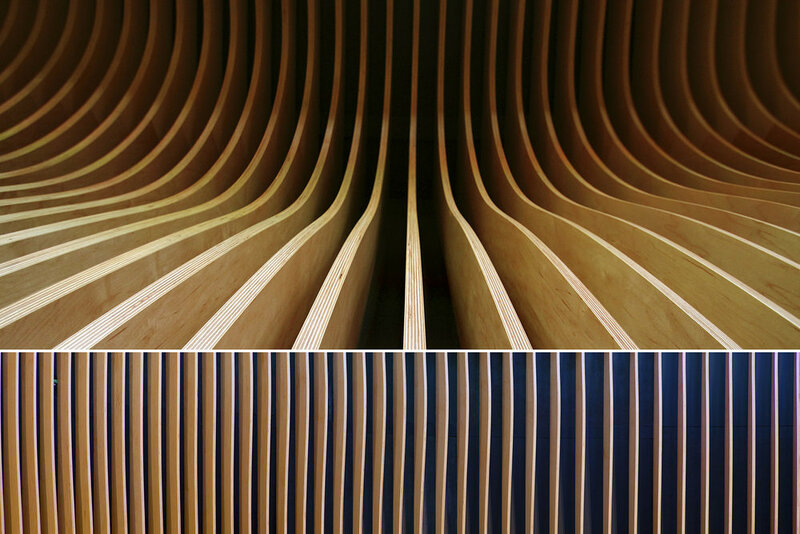 The solution is a system of sculpted wall “fins”, circumscribing the room’s perimeter to create an acoustically tailored surface that disperses sound waves in random directions. Each fin is uniquely shaped, but is only slightly different in terms of the side-profile from its adjacent neighbors, creating an undulating three-dimensional surface. Further, the fin to fin spacing is variable. Together, the spacing between the fins and their geometries sufficiently distribute sound waves appropriately to achieve not merely the desired sonic performance, but a unique visual expression. The project results from a close collaboration between the architects, acoustical-experts and fabricators. The custom-designed wooden-fins were CNC-milled, and elements like blind-doors, electrical-outlets and A/V-equipment precisely synchronized to fit in slots between them. To coordinate the layout and installation of the fin-system, full-size templates were produced to guide the positioning of the fins within the space. Despite careful mechanisms in place, the size and shape of the room meant that even minute rotational errors could cause displacements by several inches at the perimeter. The tolerances were such that even humidity inside the room could skew the dimensions. Extreme care and frequent on-site consultations were required to ensure that the system was aligned accurately. The LEED Gold-certified project places emphasis on conserving water and energy, using 100% green power, specifying environmentally friendly building materials, and diverting construction waste. Among the credits earned are points resulting from the use of salvaged redwood paneling, low-VOC paints, carpeting, and energy efficient lighting and hardware.